Just back from a walk across to Calella de Palafrugell and there is a beautiful sea mist rolling in from the sea. These early season mists are the result of the hot days starting, but the still relatively cool sea. The water warms the sea water lifting out a soft cool mist into the air. The can be quite mistical the way they roll in across the hills into otherwise bright sunny days. Actually in Calella de Palafrugell, the town is wrapped in shroud of fog lifting across the sea into the bars and restaurants by the port. There were some disappointed holidaymakers around and no-one on the beach, probably completely unaware that if they went up to the top of the town, or a half mile inland the weather was completely different - perfect blue sky and one of the warmest days of the year so far. The best thing about the fogs is that they keep the moisture in the air, so now in May, we have fields of green wheat just about to reach first harvest, and meadows of red poppies and all manner of flowers. 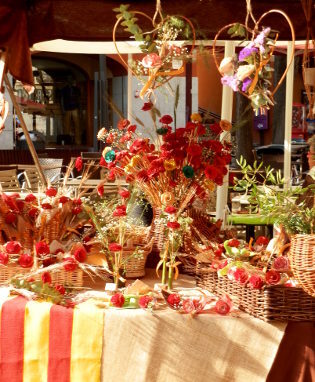 So as a hint, early in the season, if the sea mist comes in, then head inland to the villages of the Costa Brava for the abundance of flowers and colour. Tossa de Mar is one of the most popular destinations on the Costa Brava for holiday makers who come for the beach, the castle and old town walls that almost seem to tumble into the sea, and the busy bars and restaurants that run along the back of the two main beaches. 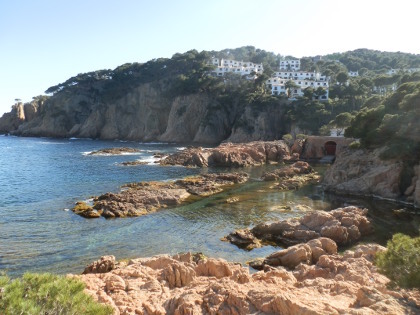 We've walked to the north (towards Cala Pola) and from the south on the GR92 from Lloret. 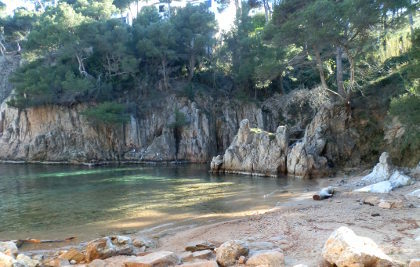 This walk takes us down to Cala Llorell - the next beach to the south of Tossa de Mar. A grumble for the GR92 from Lloret is the way the path passes across the top of some of the estates away from the beaches and coast itself. This can be for practical purposes, such as a lack of access for a beach framed by cliffs at one end, but also a number of the beaches have almost become private estates, fenced off and with a single point of access from the top with the route for walkers often a dull fence lined path through the hills at the back, without obvious diversions or routes down to the sea. Cala Llorell is case in point, and was one of the few beaches on the Costa Brava we still hadn't visited, so this was a bit of an explore south from Tossa. Our first problem was that Tossa de Mar on a May Day weekend was full of visitors, though the beaches were still pretty empty as we're not quite into swimming season yet. However, it did mean that the car parks were very busy, so not being afraid of a little walk, we parked on the outskirts by the sports centre and walked along the stream path into town. The roads through town were jammed - fine for browsing and strolling in the spring sunshine, but a little too slow for what we wanted to walk. 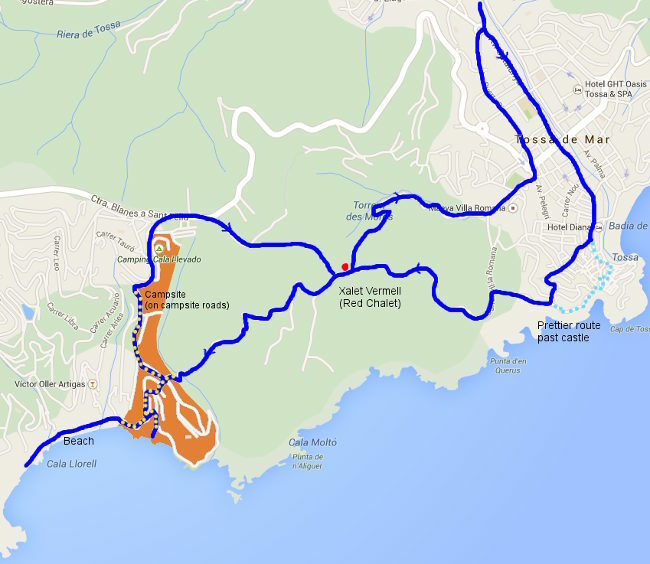 So instead of taking the route to the old town and the castle and then up over the hidden pretty beach of Codolar and the Cami de Ronda, we nip through the quieter backstreets up to the top path. The top leads to some spectacular views from the Mirador de Codolar high on the cliffs over the town and there were plenty of people making the walk to take in the view. We carried on out though, joining the GR92 through the pine woods as we climb up and away from Tossa de Mar. The path is broad and gravelly and well used. At a point just after the Xalet Vermell (the Red Chalet) - so called because it's a small red house and the only real feature on the path, the path splits. The GR92 turns to the right and the path down to Llorell continues downhill towards the sea. The path is fairly plain through the trees, but you have to be careful to keep to higher paths to the right - marked with arrows - as the routes down to the left are all dead ends. The path emerges into the campsite of Camping Cala Llevado which takes up a huge part of the hillside. In fact the campsite looks excellent with large amounts of terraced spaces and some quite luxury looking wood cabins around. To get down to the beaches though you have to walk on the roads through the campsite. In May this is not a problem, but in the height of summer, access may be more restricted for non-campers - something to check. For our initial path we just head straight down for the first beach, down a long stretch of steps marked out with wood to a very small (and in summer naturist) beach at the bottom. All the way back up and then around the road to the pretty double-bayed beach of Cala Llorell. This beach is backed by a beach-club bar with an estate of houses dotted around the hillside to the back feeling like a private club-type resort. 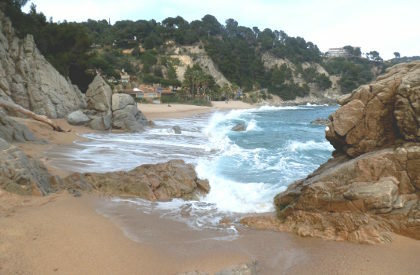 The sand is the same gritty sand of Lloret and Tossa and is split by a rocky outcrop in the middle. We could see a third smaller beach at the far end with a walkway around the cliff, but didn't go that far around. Coming back we took the main campsite road up to the top and the main entrance (just opposite a rugby ground). 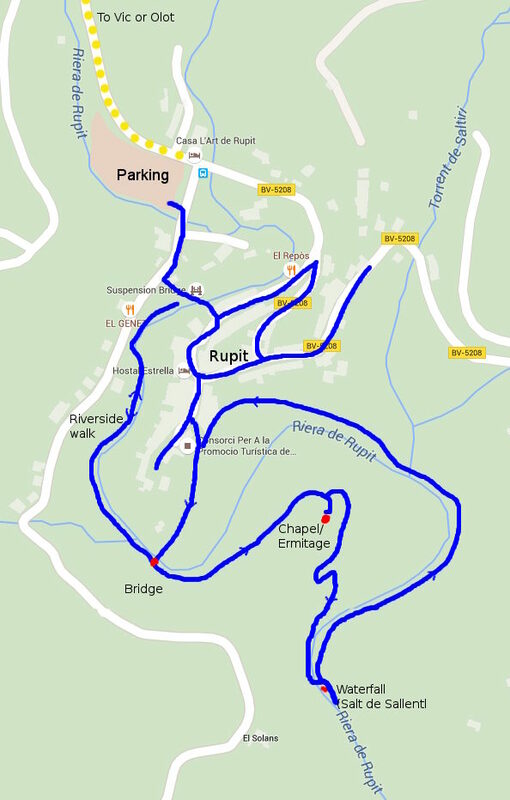 This is back to the GR92 which for this part across the top of the campsite follows the main Lloret to Tossa road. On the first path off, the GR92 turns into the woods and after a while we find ourselves back at the Xalet Vermell. Instead of repeating the route back, we take the first left after the Chalet down into the woods, following the stream making for a very pleasant descent through the woods with new leaves on the trees. Above us we can see the Torre de Moriscos - the Moor's Tower. The path emerges at the back of the main car parks for Tossa close to the bus station and would be an option for walking avoiding the centre of Tossa and the route by the cliffs. Sant Jordi (Saint George's day) on the 23rd April is probably my favourite Catalan festival. 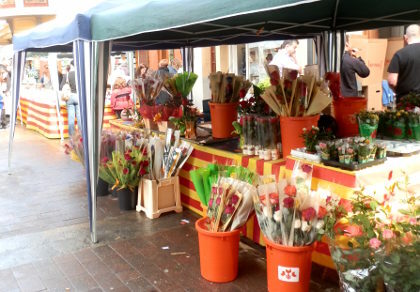 Unlike England, which shares the same day, a Catalonian Dia de Sant Jordi is a celebration of love and literature. The tradition is that a man gives his partner a rose, and she gives him a book. In practice everyone gives each other books and roses. The book part is relatively new - only started in 1929, but comes about because the 23rd April commemorates Shakespeare's and Cervantes birth day and, now for locals, the death of probably the most famous modern Catalan writer Josep Pla (of Palafrugell...). In 1996 23rd April became the first international book day. The combination of literature, roses and romance is delightful. Sellers put stalls out on the streets decorated with the yellow and red of the Catalan flag and it seems to be a day that everyone is smiling. Much better than the sickly sweet Valentines day with it's excess of chocolate and bad taste. Palafrugell itself, is the central town for the municipality that includes the coastal towns of Calella de Palafrugell, Llafranc and Tamariu. 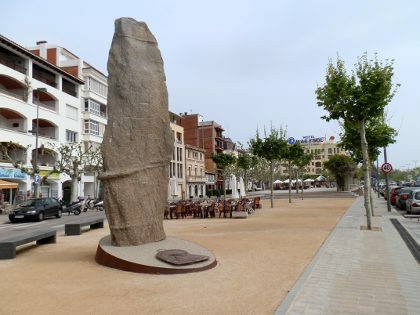 While the coastal villages are tourist heaven, Palafrugell itself is a working town, once the largest cork producer in the world and the active centre for locals from many of the villages including Pals and Begur to the north. It has character without being pretty in itself and a huge Sunday market that stretches through half the streets of the town to the north. It can feel strangely quite dead during lunchtime for the long mid-day break, but very busy in the evening with bars and occasionally music and sardanes in the evenings. 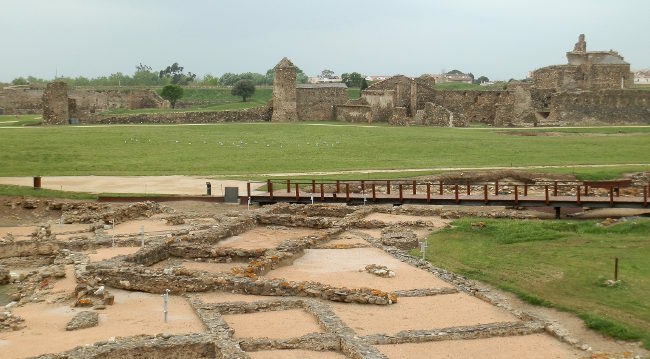 Visitors will probably see the supermarkets on the road that runs around to beach-side villages, but it's worth visiting to get a taste of real Catalan life, though the one way system can be a little confusing for newcomers trying to find the centre. On the north side of Tamariu in the direction of Aiguablava, the hillside is filled by an estate of luxury villas and a private mini-village that runs down to the tiny beach of Aigua Xelida. Recently they have improved the paths in the area and it's now easier to walk close to the cliffs above some of the tiny rocky bays with some spectacular scenery. Be warned, there are lots of steps on this particular walk - more than 200 in each of the two upward stretches. Access is easy from Tamariu following the sign posts to Aigua Xelida (or Gelida?) slightly out of town and up the hill into the estate. At the top roundabout the road runs down hill to an area where it splits in two with easy parking on both sides. The main access to Aigua Xelida beach is straight in front of us, down through the trees on a dirt path full of soft pine needles. However for this walk we're making a slightly different loop, so we take the cutting next to the white house down to the next road. 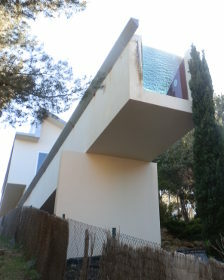 The house itself is a bit unusual - at the end of the cutting and when we look back we can see the glass end of a long thin pool - it must be swimming with a view. We follow the road around to find the entrance to the cliffside path. This has recently been done up and the paths are now indicated with yellow painted wooden markers. We are actually high above a small bay and a couple of small islands with seagulls nesting on the cliff face. The path curls around the top giving unspoilted coastal views before running slightly off the cliff edge and round a small gully. This small gully is a sea-hole, a long crack in the cliffs that allows you to see down to the sea below, no more than about a metre wide all the way down. With a suitable wind, the gap makes the noise of the sea echo and moan through the gap almost like a voice. 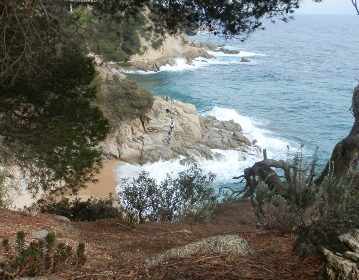 We now follow the path down to the edge of a small rocky bay and then around a path with low growing pines reaching out blocking our way as fun obstacles to scramble around. Around the back of a fisherman's house we follow the steps down to the main and very tiny beach at Aigua Xelida. The water though is crystal clear. The beach itself has a small natural stream with fresh water running across the rocks of the beach directly into the sea. The first time we visited this bay a while ago, was on a cold January day, and the stream had frozen (Xelida=iced) with icicles dangling from the moss. From the bay, we now head upwards. It's mostly steps now to the top of the cliff on the north side. The path is good though and well maintained with a small wall for guidance. The path runs next to a private village type estate which means that if you do go up this way, the only walking route back to the start (without retracing your steps), is the loop we're doing. 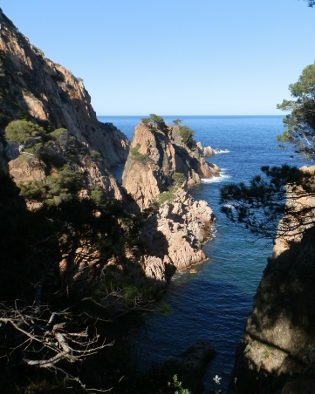 The views from the path are excellent back to the beach and coves, slightly hidden behind the trees. At the top we meet one of the roads into the estate. This is very much luxury estate territory with big houses in big mature gardens overlooking the sea. The road technically is a dead end, but for walkers there are two options. The first is to take one of the cuttings to the left down through the houses to a path that runs closer to the cliffs. This is relatively short though and it's 100 steps back up to the top. This then gets added to the next 100 steps as we head up and out on the wooden steps that run between the houses up the hill (next to the red house). At the top we stay with an estate road that curls to a track. 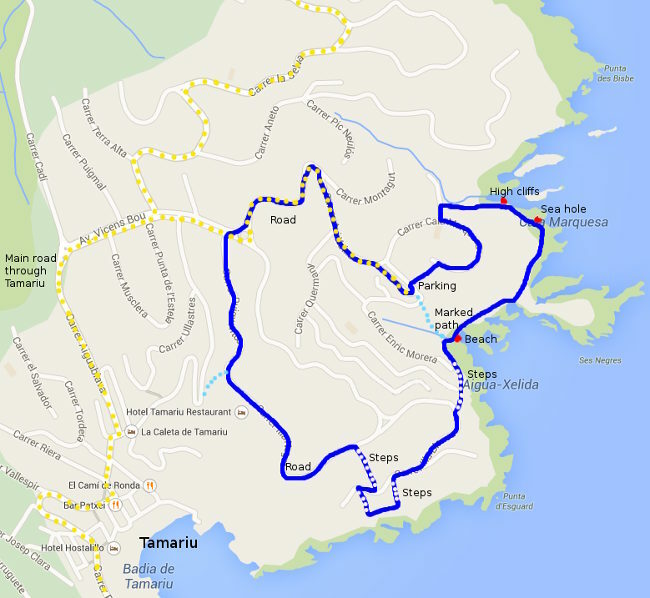 At the point the track meets the road there is a cutting down towards Tamariu. But instead we stay on top and follow the road and path back to the car. 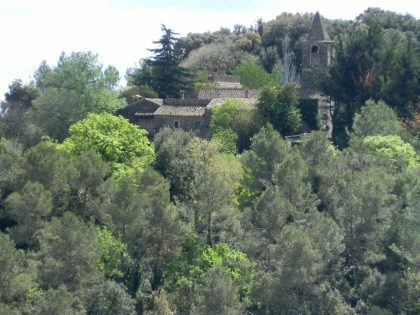 Situated on the way to Banyoles, Palol de Revardit is a small, pretty village/hamlet with a newly restored castle set among the hills behind Girona. 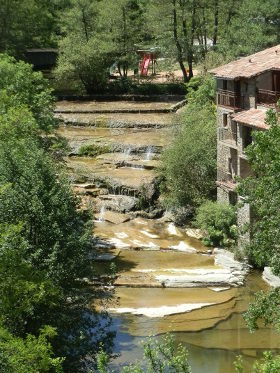 Access to the village is from the C66 dual carriageway between Girona and Banyoles. 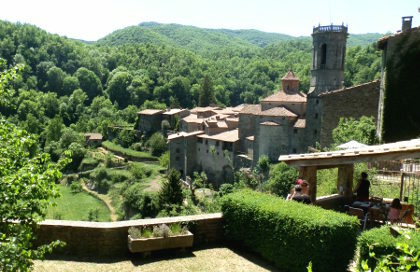 This walk takes us from the village into the hills and up to the hilltop ridge at La Mota which looks over the countryside to the Pyrenees and out to the sea on one side, and across to Girona on the other. The walk up to La Mota is clearly marked from Palol de Revardit, the walk down is a little less clearly marked. W e park by the castle at Palol de Revardit. The village is quite small with probably less than a hundred houses and a small ajuntament, but the castle has recently been renovated and the village is very well kept. After a little explore and getting our bearings, we find the signpost marked for the route to La Mota (4.2km). 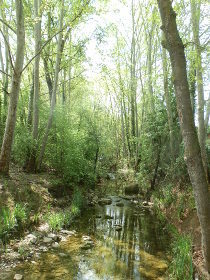 The first part of the walk is along a small village lane that crosses a small stream before a gentle climb to the hills. Though we're on the road it's quiet as the roads only lead to the hills and local farms. Being spring, the morning was dotted with rain but as we arrived at Palol, the afternoon broke out into a warm bluesky dotted with clouds and it feels like everything is growing. The trees have that fresh verdent green of new leaves and the flowers are filling the meadows. After a short climb past one of the old farms used for tourisme rural, the sign posts take us of the road and up a broad track into the hills. We have the first sound of a cuckoo to accompany us as we follow the track up through the woods. The ground is drying under our feet as we walk and it's a steady slightly humid climb in among a mix of pines and deciduous trees. The track is broad and pleasant without having too many highlights and after around 2km emerges at a set of meadows just below Sant Marti de la Mota church, perched on the hill ahead of us. The path splits at this point and we could head directly to Els Refugis de la Mota, but instead take the road to the church we can see, part a newly renovated masia with commanding views over plains below. 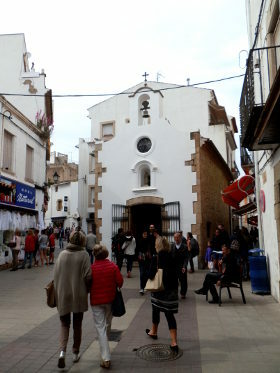 The road does a down and up, and we emerge close to the chapel/church of Sant Marti. 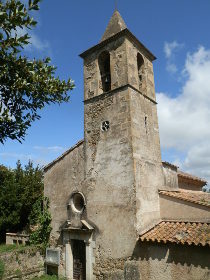 The church, like many more isolated ones, is connected to a farmhouse and we meet the owners who point out the views out towards the sea in the distance. We now follow another road along the ridge at the top of the hill. To begin with all the views are to the north, but as we come close to a small urbanisation the views open up across to Girona, with the cathedral clearly visible from where we are. The views extend all around, to the ancient former volcano above Canet d'Adri and up to the Rocacorba mountains behind us. As is common with many of these highpoints, there is a dolmen close to the top. 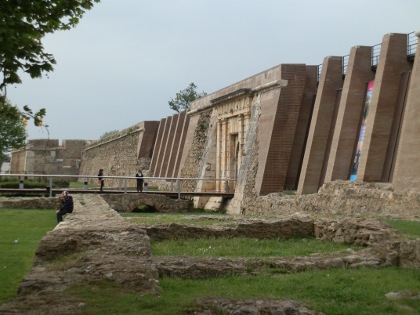 The sign says the grave is 5,000 years old, but these ancient burial sites are never quite as impressive a you might expect. The route down follows a track just behind a small playground for the urbanisation that runs under the urbanisation hill on the right, with a stream or gully turning into a valley to the left. It wasn't entirely clear if the track was the route to start with but it was fine - more surprising was that someone had just driven it from the look of the tracks, despite the mud and heavy pot-marks. The rain had left the track muddy in contrast to the dry track we came up, and from time to time we have to negotiate slippy puddles on the way down, but again it's more pleasant wood-walking without stand-out things to see. Towards the bottom we cross a stream on stepping stones and pass a couple of old farms being rennovated before walking past tree plantations in the bottom of a shallow valley. We emerge from the path at the Veinet de Can Padres. We were trying to get back to Palol directly, but didn't see a path. 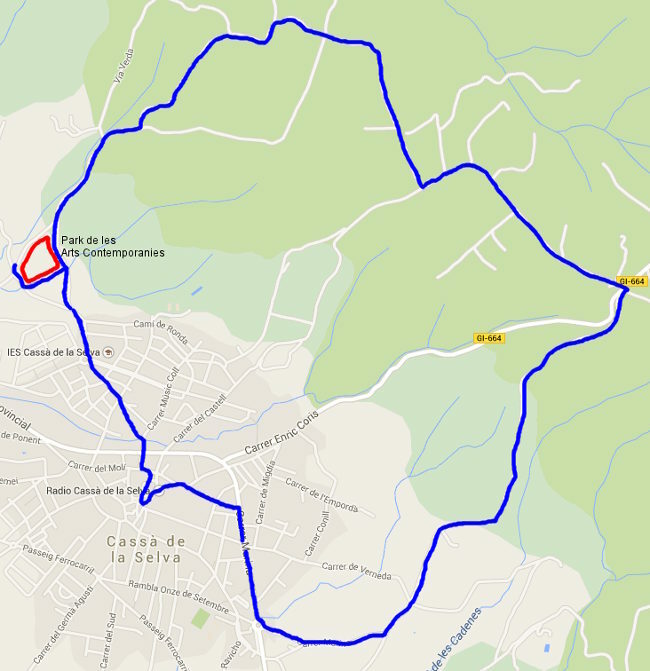 Unfortunately the connection from Can Padres to Palol is road all the way - and a newly refurbished road, but there are only three or four cars. 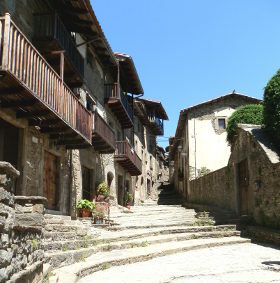 The road takes us above Palol with views of the village and its surrounding, before turning off and then down back towards the castle. 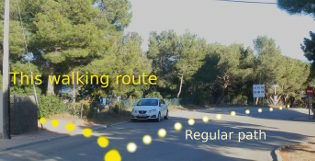 From Girona Airport to the Costa Brava for Sant Feliu de Guixols, Palamos and Palafrugell, after passing through the small village of Ruidellots de la Selva, the C66 road skirts past the larger town of Cassa de la Selva. 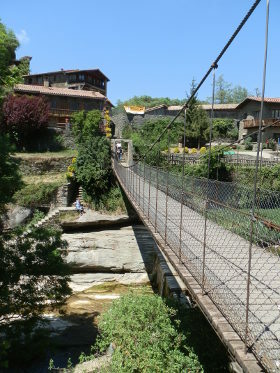 The town is on the flat just under the Gavarres with a fabulous if demanding cycle route over the hills behind to La Bisbal. 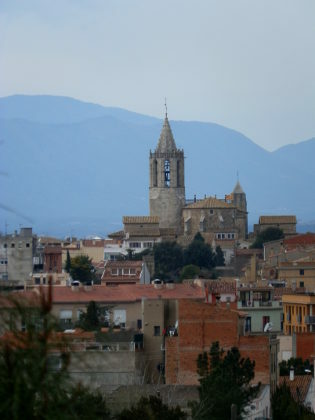 Being set back from the road, it's very easy just to drive by looking only at the industrial estates on the outside, but it is a traditional Catalan town with a pleasant town centre. Our aim is a gentle walk into the rolling farmland behind the town itself, rather than into the heights of the Gaverres. The early part of this walk has some views towards Montseny, though it was a day with rain in the air so not clear enough for good photos. The second half of the walk after crossing the GI664 has more expansive views to Girona and the mountains. 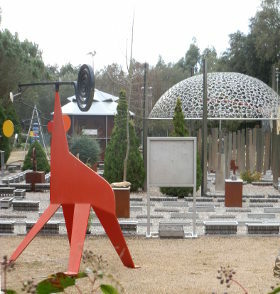 An unexpected feature was the Park de les Arts Contemporanies - a large open air museum with modern sculpture. Unfortunately it was closed out of season but is a place to re-visit. To start we park in one of the municipal car parks on the main inner road around the centre of Cassa. Cassa itself has an older part around the church and a more modern (1920s) area situated by the old Casino (a meeting place rather than a gambling den). We're not really visiting the town this time, though we do drift into the centre on the way back. From the car park we go to the real start, just by a roundabout on the edge of the town. This is clearly marked with a signpost and we following the yellow-white markers for a local route. Initially we walk past a few industrial units towards farms, before turning up a track into the woods and up a hill. All OK, but not spectacular. At the top of the hill is a small water deposit with views across Cassa and down towards the mountains of Montseny (towards Barcelona). This is farming countryside with fields and woods and large isolated farm houses, rather than the dense alsina forests of higher up in the Gavarres. We cross the road that links Cassa to La Bisbal. 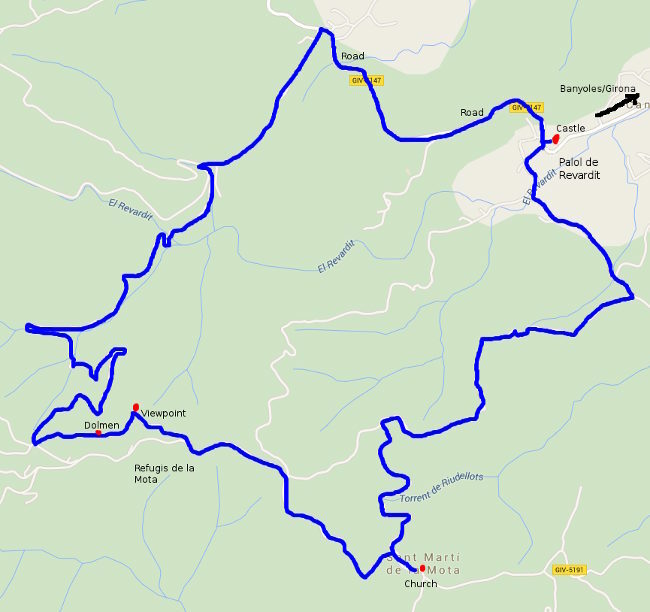 This is a lovely cycling route for those who like hill climbs, rising up to 400m or so with a dramatic change in scenery as you leave the farmlands and reach more isolated and higher levels of the Gavarre hills, before coming down again to La Bisbal. Our walk continues past more farms. It's not completely isolated and in two of the houses, there seem to be family gatherings with lots of cars parked in the yard and the smell of barbequing sausages drifting in the wind. The view starts to open out and we find horse tracks all the path. We have views to the flashing telecoms tower in Girona and a grand vista which takes in Girona airport and the hills beyond. We pass one of the horse-riding centres sweeping under the hills to our right, then start our return journey just a little ahead of the official path, turning down past a tumble down masia into the woods. Ahead of us the road splits. The signpost to the left says Cassa so we take that and end up at the back of the modern art park, where we can peek through the fence at the curious collection of mechanical and modern art sculptures. To find out more we make a brief diversion to the front, but it's closed at the moment - only open by appointment. Presumeably it will re-open during summer. 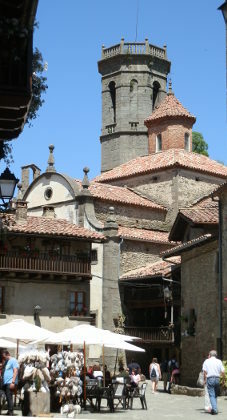 We then turn back to Cassa heading straight for the church and the pedestrianised shopping streets that are quiet and closed on Sunday afternoon. A slight mis-direction means that we miss the more modern part of Cassa with the Casino and instead end up at the car. 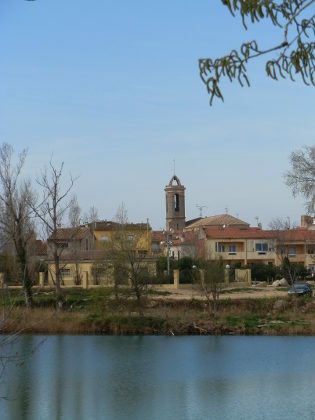 Sant Pere Pescador is a small town situated between L'Escala and Roses on the banks of the River Fluvia, not quite on the coast itself. 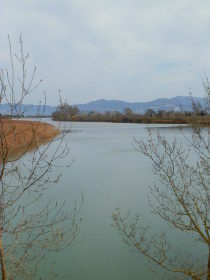 The northern side of the Fluvia runs into the Aiguamolls d'Emporda - a vast wetlands reserve for wild birds including storks and flamingoes. 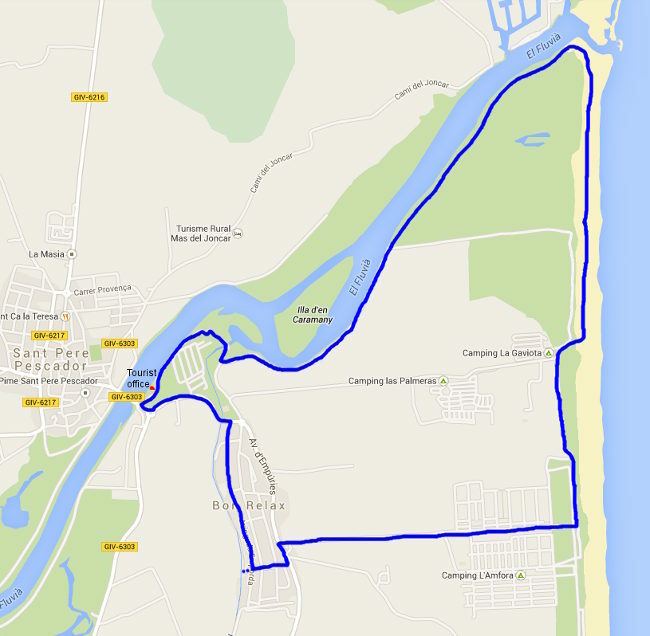 The southern side of the river connects to the long broad beach that carries on for about 7km down past Sant Marti d'Empuries. The area is quite flat with lots of campsites and not much habitation otherwise. 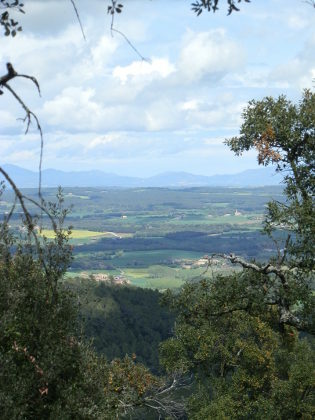 More inland, the countryside is flat with expanses of espallier orchards and fruit farms. We parked just outside the town of Sant Pere Pescador, close to a tourist information centre just before the bridge across the river into town. 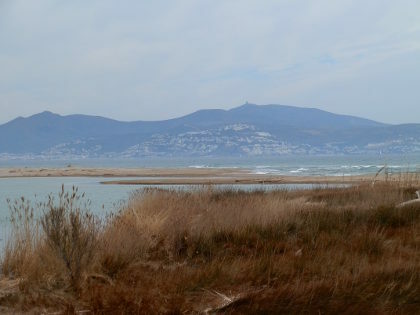 For this visit we didn't go into Sant Pere Pescador itself as we were more interested in the coastal scenery just south of El Fluvia - the north side is the Aiguamolls d'Emporda wetlands bird sanctuary. The path was then very easy to follow and entirely flat the whole way around. The day was a little overcast and greyish days with low scenery don't make for the best photos. We walk firstly just following the river which is actually quite wide and in fact, with the reeds in the water, the birds and the low trees at times it felt like we could have been walking in the Fens or the East Anglian coast. The main walk out along the river we could see cormorants on the water and collections of anglers parked and fishing on the other side of the river. A queue of stand-up paddle-boarders on the river was the only sign of tourist type activities, though I guess in summer the area will be much busier and the whole area is full of campsites. The river path eventually runs past fields of low sandy dunes with beach vegetation of grasses and low shrubs before reaching the beach where the Fluvia meets the sea (the Gola). 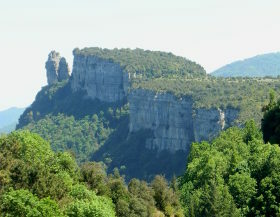 A small viewing platform allows you to get about 3m above the height of the land and though it doesn't sound much, because of the low level of the ground, the extra height opens up views to Roses and out to the Pyrenees in the background as well as providing vistas back along the river to Sant Pere. The beach itself is long and broad - it runs 7-8km straight down towards Sant Marti d'Empuries - with soft sand underfoot. The winter weather creates undulations in the sand so as we walk along the beach we're continually going up and down and with occasional soft patches, the walking is harder work than we expected. We're not the only ones on the beach, but it is very sparsely populated. A few other Sunday afternoon walker and, ahead of us, someone testing out motorised paragliders taking off, making a short hop along the beach, then landing before repeating the exercise. The beach runs at the back of a number of campsites, set back a little from the beach. Now, out of season, they are all closed up, but even in the height of summer, the sand is so broad that it would be difficult to imagine that it would get very crowded. We come off the beach and follow a small path a little closer to the campsites, mainly to get off the sand, then by Camping Amfora we follow a strange wide boulevard past an isolated estate of villas back towards Sant Pere Pescador. 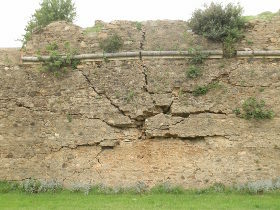 The aim was to see if we could connect to L'Armentera via the Bon Relax estates, but unfortunately the connecting path that we were hoping might exist doesn't exist. So instead we wander through the villas and strange set of high rise blocks of the Bon Relax estate. These are the high rise blocks that can be seen from miles away and feel totally out of place in what otherwise is a low-height area. The estate also feels strangely disconnected - it's not by a town or village, it's not on the sea and there are no other buildings or industry nearby. The path from Bon Relax to Sant Pere Pescador goes along the road for a short while and back to the car. For walking, the stretch from the beach to Bon Relax could easily be skipped, just staying on the path closer to the Fluvia. 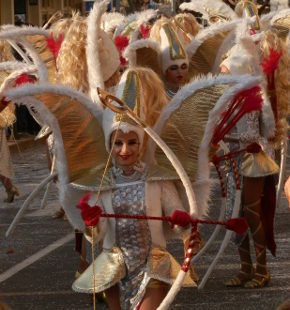 Palamos, like nearly all the Costa Brava towns has a large carnival procession to celebrate the coming of Lent where people dress up, dance and compete for the best show in town. 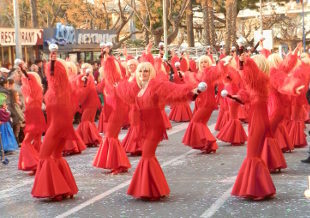 In Catalonia, as with many European Catholic regions, carnival has developed into a grand tradition even though it was actually banned in Franco's time. The modern festivals are now enormous. 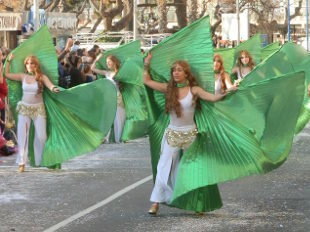 Palamos had about 50 floats this year and the amount of work put into costumes and practicing dance routines is huge often with 40-50 dancers in matching outfits following a float blaring out their dance music. 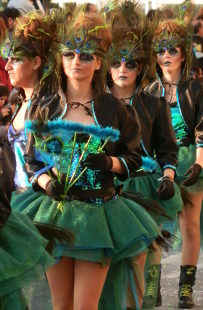 There are carnival processsions is most of the major towns (except for Palafrugell which has a Festa de Primavera at the end of May instead), but rather than having competing carnival processions, the festivities are often staged on different days in different places. This allows the carrossellers to attend more than one festival. 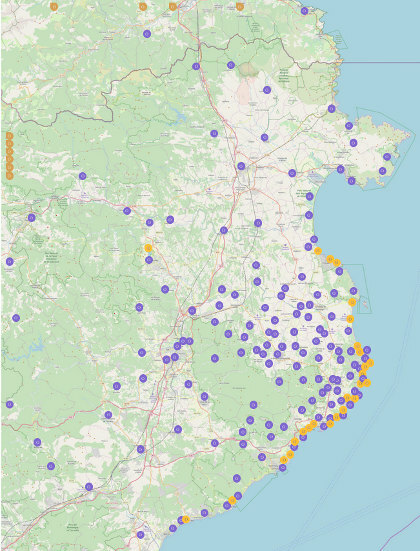 For instance, floats from Sant Feliu de Guixols on a Friday would then visit Platja d'Aro or Palamos on the Saturday and then move to a different town on the Sunday. 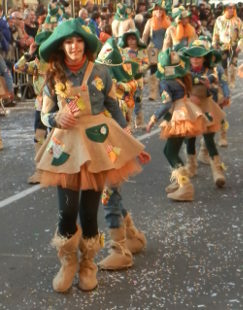 The processions in Palamos this year was reported at about 50 floats (I believe some others got up to closer to 80). The floats naturally follow the procession route but not as a steady moving stream. At one point (usually towards the end) there is a judges stand where each float and troupe takes the time to show and perform their choreography danced routine for 3-4 minutes. If you count 3-4 minutes per float and 50 floats plus time for walking and changeover it won't be surprising that a typical big carnival procession takes at least 4-5 hours to complete. The early floats starting in the daylight at the end of the afternoon, with the last ones coming in when its dark. Though the fun of taking part and showing off is a big part, a hidden incentive are the prizes for the best carrossers. There are normally different categories from best large float, best small float, best local float, best dance routine etc and for some of the main categories prize money can reach €1,000 for the winning float - though almost all of this prize money will be reinvested to build a bigger better float for the next year. 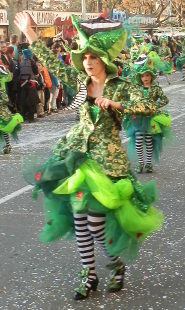 The run up to carnival (or carnestoltes) has children going to school in fancy dress (disfreses) with essentially a big party atmosphere all weekend - slightly amplified this year by Valentines Day, though Valentine's is somewhat new in Spain. Palamos itself is an old royal port with an old central part and large fishing fleet. The main port is large enough for big ships and through the summer regularly gets visits from smaller cruise ships. Around the main port area and through the older part of the town there are many good restaurants and bars and streets that climb up and down across the headland in the heart of the old town. At the end of the headland is the new marina and around the corner is the extremely pretty soft-sand bay of La Fosca making the whole town one of many contrasts. One downside for first time visitors is that Palamos has three enormous ugly tower blocks built just off the main beach and the blocky newer area behind the main beach passeo-walk both of which lack ambience and character which can leave a poor first impression. Our reaction on first visiting Palamos was that we didn't really care for the newer parts, but now we visit more often, we've found it growing on us as a town - it has a strong local character and joie de vivre that makes the place interesting year round. 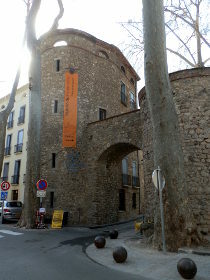 Ceret is a delightful French Catalan town, just the other side of the French border, just over an hour from the heart of the Costa Brava with a understated unspoilt charm and a strong connection to the Modern Art movement at the start of the 20th Century. Though it is marked from the autoroute, it's a town we have overlooked as we've headed more to Perpignan, to the mountains (eg Villefranche de Confluent) or to the coast - for instance to Elne on our previous French day-trips. Ceret main claim to fame was though its connection to many famous twentieth century artists. Pablo Picasso (during his cubist phase) and George Braque were residents in 1911-1912 (eg see Picasso's Landscape at Ceret from the Guggenheim), attracting other famous artists like Chagall, Matisse and Modigliani. Ceret now has a Museum of Modern Art with works donated by these illustrious former residents. Now it's fair to say that we didn't know this before we visited - we were looking for somewhere new to go before doing our periodic foray into French supermarkets for cordial, cheese and a few other French delicacies that somehow never seem to cross the border, or are otherwise have massively over-inflated prices in Spain. As a result we haven't yet visited the museum, but from this one visit, Ceret now ranks as our favourite French Catalan town. 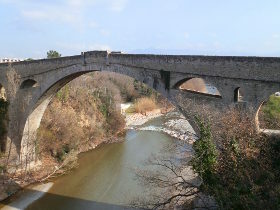 We parked just outside the town's outskirts on the far side of the river Tech and walked across the Devil's Bridge (Pont du Diable) - the old, very high, medieval stone bridge across the river that sits next to a modern road bridge. From here it was just a question of following our nose to reach the old town centre, a pleasant stroll through well-kept houses. Though Ceret is definitely Catalan (road names are still in Catalan, often with a French alternative), it is a town that feels typically French - shutters on the windows, coloured walls on the outside of the buildings, people sat outside the cafes and tall plain trees for shade. 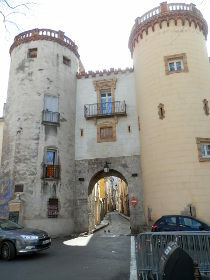 The first place of interest we came to was the large town gate flanked by two round towers (the Porte de France). This leads to old cobbled streets in the old centre, that curl around what would have been the town wall before coming together in the main town square or placa, with the Gran Cafe and hotel and a tower and arch construction which are what is left of the towns Porte d'Espange, at the back of which is a modern art fountain built to celebrate the towns connection with modern art with a copy of Picasso's Sardanes work. 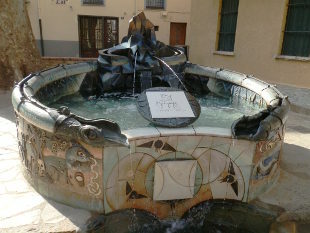 There are several little squares in the maze of streets and a number of different fountains through the town. The town boasts two museums - the art museum mentioned and a museum of musical instruments, but this time around we didn't visit, but we may well come back in May for the town's cherry festival.